DVDFab Virtual Drive is a virtual DVD/Blu-ray emulator. It emulates maximum 18 drives and works with DVD/Blu-ray images created by DVDFab and other programs. For example, to play a Blu-ray backup on PC with PowerDVD 8 or above, you need to use DVDFab to backup the Blu-ray to an ISO image file, and use DVDFab Virtual Drive to mount it, then, PowerDVD will play it. Features Highlight: 1. Emulate maximum 18 drives. 2. Work with both DVD and Blu-ray imagaes. 3. Play a Blu-ray ISO file backup on PC with PowerDVD 8 and above. System Requirements: Windows 7/Vista/XP/2000 (32-bit/64-bit) X86/X64, Pentium II 500 MHz, 256 MB of RAM. 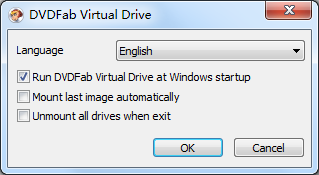 For more information about DVDFab Virtual Drive, please visit www.dvdfab.com/virtual-drive.htm.